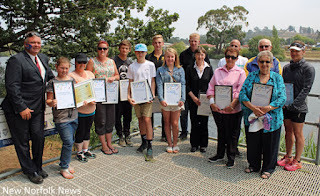 Mayor Martyn Evans and the Australia Day award recipients. WARM but overcast conditions provided pleasant weather for this year's Australia Day observance in New Norfolk. Moved back to the Esplanade after five years at Tynwald Park, the program did not vary greatly from previous years but the committee may have spread it too thinly by scattering the activities from one end of the reserve to the other. The New Norfolk Lions Club cooked a free sausage sizzle and the New Norfolk Junior Football Association sold burgers at the far end of the field. The annual fun run and walk was conducted over a shorter course than usual, and an increased number of children's games and activities were conducted. Young members of the New Norfolk Scouts performed the flag raising and musical entertainment was provided by the Derwent Valley Choir and Derwent Valley Concert Band. Facepainting and a coffee van were new features and both proved popular. 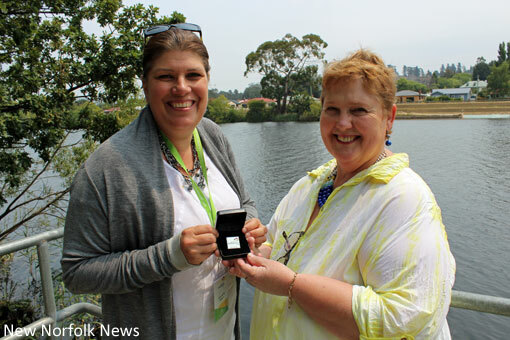 An address was given by Australia Day Ambassador and breast cancer campaigner Deborah De Williams. A presentation was made to Ms De Williams by Councillor Julie Triffett in acknowledgement of her service as an Australia Day Ambassador. Ms De Williams spoke of the special place New Norfolk has in her life as it was near here that she broke the world record for the longest continuous run by a woman on May 6, 2011. Certificates acknowledging contributions to the Derwent Valley were awarded to: Mollie Pitt, Joanne Raskewicz, Viv Cardwell, Kaye Menzie, Danielle Nossiter, Tyron Bailey, Shakira Bone, Thomas Fulton, Matt Byrne, Nathanial Graham, New Norfolk Can-Hope Cancer Support Group, Tree2Sea and Fairview Primary School Association. A shoutout to Noah Clarke who won the Under-13 category of the gumboot-throwing contest: please contact Matt Hill at the Derwent Valley Council to collect your prize. Phone 6261 2687.